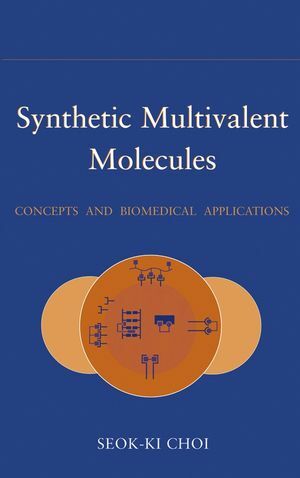 This book provides basic principles of multivalent interactions found in biological systems as well as an up-to-date and thorough coverage in design concepts, syntheses, and biological activities of multivalent molecules. SEOK-KI CHOI works for Theravance, Inc., where he gained firsthand insight into the application of multivalent drug design and development. Prior to his work at Theravance, he served on the faculty in the Department of Chemistry and Chemical Biology at Harvard University, establishing his credentials in the field. He is a member of the American Chemical Society and has authored several papers and articles in the biochemistry field. Notes for Organization and Classification. 1.2 Mechanistic Aspects of Multivalent Interaction. 1.3 Biological Roles of Multivalent Ligands. 2 Multivalent Molecules Applied to Viral Targets. 2.8 Nucleic Acids of Viruses. 3 Multivalent Molecules Applied to Bacterial Targets. 3.1 Targets in Bacterial Cell Membranes. 3.5 Multivalent Molecules as Synthetic Vaccines. 4 Multivalent Molecules Applied to Cellular Targets. 4.1 Carbohydrate-Recognition Receptors on Cell Surfaces. 4.2 Peptide and Hormone Recognition Receptors on Cell Surfaces. 5 Chemical Synthesis of Multivalent Molecules. 5.1 Selected Synthetic Methods for Multimerization. Table 1. Divalent Ligands Linked to Enzymes in Human Immunodeficiency Virus (HIV). Table 2. Multivalent Ligands Linked to gp120 Surface Receptors in Human Immunodeficiency Virus. Table 3. Multivalent Ligands Linked to Surface Receptors on Viruses. Table 4. Multivalent Receptors Targeting Multivalent Ligands in Bacterial Cell Walls. Table 5. Multivalent Ligands Targeting Bacterial Receptors in Membrane Surfaces. Table 6. Multivalent Ligands Linked to Bacterial Toxins. Table 7. Multivalent Molecules Targeting Bacterial Enzymes. Table 8. Multivalent Ligands Targeting Carbohydrate-Recognition Receptors on Cellular Surfaces. Table 9. Multivalent Ligands Targeting Noncarbohydrate-Recognition Receptors on Cellular Surfaces. Table 10. Multivalent Ligands Linked to Selectins on Cell Surfaces. Table 11. Multivalent Ligands Linked to Lectins. Table 12. Multivalent Ligands Linked to Cellular Enzymes. Table 13. Multivalent Ligands Linked to G-Protein-Coupled Receptors (GPCRs). Table 14. Multivalent Ion Channel–Binding Molecules. Table 15. Homo- and Heterodivalent Chemical Inducers of Dimerization (CIDs). Table 16. Multivalent Ligands Linked to Nucleic Acids. Table 17. Synthetic Multivalent Antigens. Table 18. Multivalent Ligands Displayed on Self-Assembled Monolayer (SAM) Made of Alkanethiolate on Gold. Table 19. (Bio)chemical Modification of Cell Surface Antigens.